Don’t you miss those halcyon days when every morning we were treated to some new breaking story detailing the insane antics of Sarah Palin and her family? We were entertained on a near daily basis as Palin claimed she could see Russia or she created her own words such as “refudiate” or when she claimed that Paul Revere was ringing bells and firing musket shots to warn the British during his famous midnight ride. It was hilarious to watch her struggle to name a single newspaper or magazine which she reads, or to name a Supreme Court decision which she disagreed with or to incorrectly explain the function of the Vice President to a 5th grader. 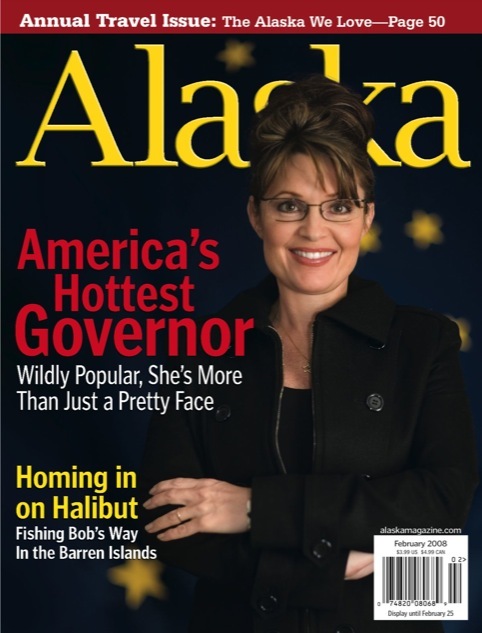 Who will ever forget when she abruptly quit her position as Governor of Alaska after having served only half a term and then jumped right into the respectable field of reality television? Ahhh, those were the days. Unfortunately (for us) however, Sarah Palin’s entertainment value came to a screeching halt last November when she announced that she would not seek the Republican nomination for President of the United States. Not only were we denied a year’s worth of belly-ache-inducing laughs, but the late night television talk shows and tabloid newspapers were denied a steady source of material. 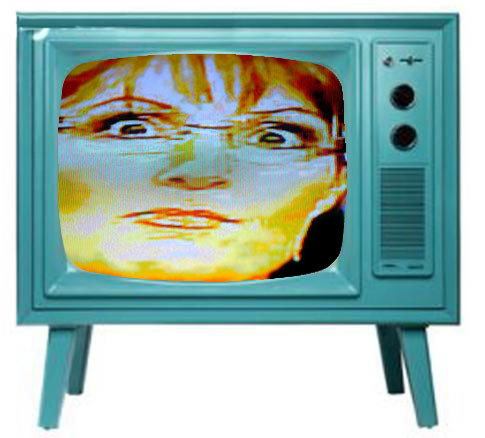 But wait!… What’s this?… We have breaking Palin news! Thank the heavens above. It’s true. Sarah Palin has awakened from her slumber and dusted off one of her favorite old chestnuts just in time for the Supreme Court’s ruling on the constitutionality of the new health care law known as the Patient Protection and Affordable Care Act. Remember when PolitiFact.com deemed Sarah Palin’s assertion that the new law provided for “death panels” the “Biggest Lie of 2009“? Well that has not dissuaded the stubborn Palin from asserting the same thing once again. You will recall that Palin initially uttered the phrase “death panels” when she opposed “end of life counseling sessions” in which physicians would educate patients on such useful estate planning tools as Durable Powers of Attorney, Health Care Proxies and Advance Directives (known as “Living Wills” in some jurisdictions). When she was forced to acknowledge that a member of the Republican Party (Maine Senator Olympia Snowe) was the initial proponent of “end of life counseling sessions”, she began to apply the phrase differently. She began claiming that “death panels” are government bureaucrats or commissions that will decide whether to pay for a patient’s health care based upon health condition or age. Despite the fact that the new law provided no such panels at all, Palin also seemed to miss the point that under our old broken health care system, insurance adjusters could unilaterally decide whether to pay for a patient’s health care based upon any arbitrary reason. Truth be damned! 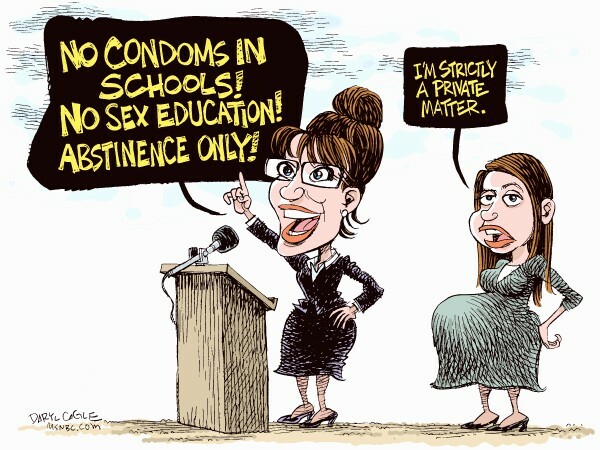 Sarah Palin has proved once again that she is either stupid or has a very short memory. Let’s take a quick look at some of Palin’s greatest hits, shall we? Why does Fox News consistently avoid utilizing mature adults as guests on its programs? It is understood that the number of legitimate and serious conservative pundits is extremely limited, but Fox News seems to revel in giving airtime to child-like whiners. Consider the number of times that Sean Hannity and Bill O’Reilly have hosted the likes of Sarah Palin, Ann Coulter and Donald Trump rather than George F. Will or Peggy Noonan. Wednesday night was a perfect example of Fox‘s studio serving as a psuedo-televised day-care for what appeared to be an over-tired and cranky guest. This time the bratty baby du jour was conservative blogger Michelle Malkin. She and Juan Williams were guests on the Hannity program and the topic was the alleged leaking of information from the Obama administration regarding proposed cyber attacks on Iran’s nuclear facilities. It is people like Michelle Malkin that make blogging so fun for so many of us. Please click on the song link below to familiarize yourselves with the tune and to have more fun singing along to today’s song parody. It appears to me that we, as a nation, may have a problem when the current crop of college students and those in our high schools and elementary schools assume the responsibility of running things. I understand that mine is not a novel opinion. This is not an original theory which is being voiced for the first time. I am approaching 50 years of age and I distinctly remember many in my parents’ and grandparents’ generation bemoaning this same potential problem. The difference however, is the likelihood of such a worry actually coming to fruition. I believe that, unlike that of our forebears, my concern is both grounded in fact and by statistics. As most of you know, I live in Boston, Massachusetts. This city has long been known as the Mecca of Education in the United States. The state boasts the best public and private elementary and secondary schools in the nation. There are over 120 colleges and universities in metropolitan Boston alone, including such diamonds as Harvard University, The Massachusetts Institute of Technology (MIT), Tufts University and Berklee College of Music. Fortune magazine has deemed Massachusetts to be “America’s Smartest State” with 16% of its population having advanced degrees and 61.8% having a college education. Also, the Science and Engineering Readiness Index (SERI) proclaimed Massachusetts as having the best primary education system in the nation (Math and Science) based on publicly available data, including Advanced Placement scores, National Assessment of Educational Progress reports, teacher certification requirements by state and physics class enrollment data. Despite the educational acumen of my home state however, I have been witnessing a disturbing trend in the last number of years. Parents seem to be too involved in their children’s lives for far too long. I must admit that I have no children and therefore I may not be aware of the degree of a parent’s innate nurturing nature for his her/her children. I did however, have parents of my own and I witnessed the actions of my friends’ parents, so I am not completely ignorant of the sort of symbiotic relationship between parent and child. My childlessness has also provided me the opportunity to have a somewhat objective view of these relationships inasmuch as I am not a member of “the parent club”. 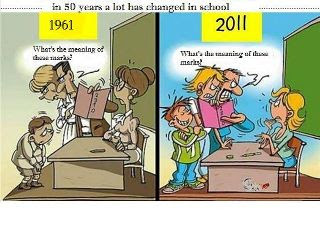 When I was growing up in the late 1960s and 1970s, my parents stressed the importance of both education and achievement. I was encouraged to do well in school and on the playing field. My parents provided assistance and guidance but they made sure that I was the major participant in those endeavors. They helped with my homework (if they could) when I was struggling and they cheered my team on during sporting events. They applauded my good grades and good games and they consoled me for lesser grades and less stellar physical prowess. In short, they provided the foundation upon which I personally would be responsible for building the finished structure which would become the adult me. I do not believe that such is the common system of parenting today. It appears to me that today’s parents view the child as an extension of themselves rather than a separate and distinct being. Time and again I am astonished to witness the degree to which today’s parents inject themselves into their child’s endeavors to the extent that the parent seems to be living vicariously through the child and the child appears to be a hollow shell wholly dependent upon the parent to function. There have also been a number of occasions when my spouse and I have been stood-up by friends who, at the last moment, have cancelled plans with us because they must write their child’s school paper or construct his class project. 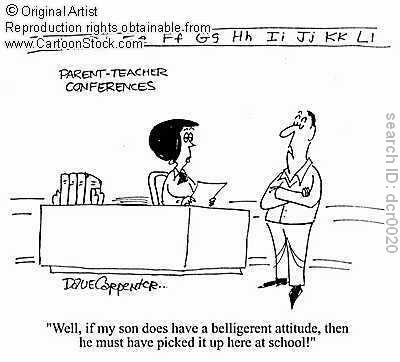 I know parents who, when their child has been given a low grade, chastise the teacher rather than encourage their child to try harder or pay more attention in class. Today, parents arrange organized “play dates” for their children only with friends they approve rather than letting kids simply play with the other kids in the neighborhood regardless of their parents’ socio-economic status. I notice that on the rare occasion when children are actually playing outside at the park, there is a supervising group of parents on-watch stifling any chance that the children might actually behave like children by means of having the occasional scuffle and establishing the natural childhood pecking order. It seems that every youth sports team now has an individual coach (in the form of his parent) for each player. Unfortunately, this super-parenting is not just limited to the child’s early and teen years. It carries into college as well. My spouse has worked at a Boston area university for over 25 years and I have been shocked to learn how parents today are involving themselves in their children’s higher education. I am told that parents accompany their children at college during the registration period to advocate for their admission to preferred classes. These parents also telephone professors and attempt to schedule office meetings with professors to discuss their grades. My spouse also says that over the years there has been an ever-increasing lack of social skills amongst university students. The cafeterias are very quiet because rather than students discussing the day’s events with one another, the vast majority simply sit quietly texting and playing games on smart phones. The same silence and solitude permeates the hallways between classes. The students even avoid making eye contact when speaking with college faculty and staff. I find all of this to be very troubling. 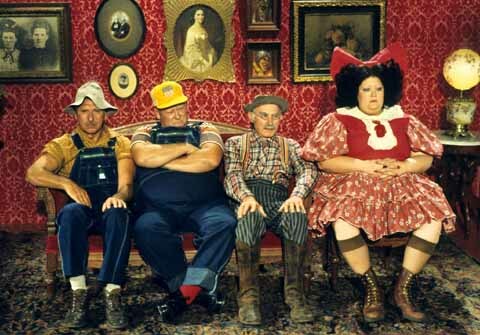 Please remember to click on the song link below to familiarize yourselves with the tune and to have more fun singing along with today’s song parody which was originally penned to describe the poorly educated Sarah Palin. As the result of a death in our family, we are taking a little bit of a break from posting substantive posts for the next few days. But that is no reason to skip out on some fun song parodies. Inasmuch as Sarah Palin fancies herself the outdoorsy type, we thought we might spoof her with the classic 1960’s theme song from television’s Daniel Boone. Sarah P. was a guv. She was a lame guv. She was a dumb guv. so she summoned “Joe the Plumber” to the scene. She looked so damn confused. She was a slick guv. Her speeches addressed “Joe Sixpack’ all the time. Drivin’ demons out with prayer! A one-time Wasilla mayor, was she! She was a big guv. So she pulled the quitting trigger, did she. She was a gun guv. And would love to blast Mike Wooten from a tree! With her lipstick and eye-liner, was she! 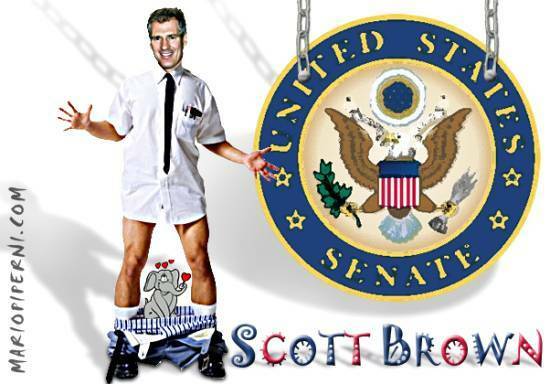 The Limbaugh Limbo: How Low Can Rush’s Ratings Go? It looks like radical right-wing radio blowhard Rush Limbaugh is sustaining even more damage than originally contemplated as the result of his Sandra Fluke controversy. Back in April, Ms. Fluke became newsworthy when she aired her belief that religiously affiliated employers (such as Georgetown Law School where she is a student) should be forced to provide the same contraceptive health care insurance coverage to women as all other (non-religiously affiliated) employers. 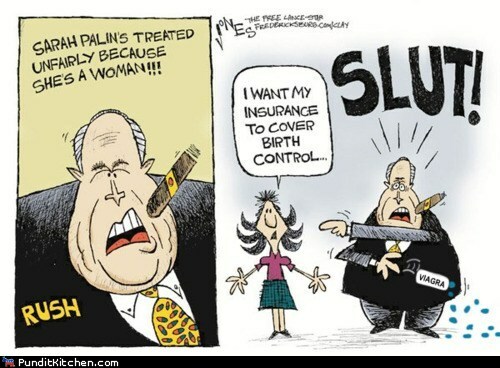 Unfortunately for Limbaugh however, he came out looking like a bully and the public reacted accordingly. A massive threatened boycott against those national businesses that continued to support Limbaugh by means of advertising on his program led to a sponsor evacuation. Some 168 national sponsors stopped advertising on Limbaugh’s radio program and at least 2 stations dropped his show. Indeed, for a lengthy period on his flagship station WABC, his commercial time consisted only of free public service announcements while his online feed featured dead air. The Stop Rush Project provides a detailed listing of all national advertisers who have dropped or are avoiding placing ads on Limbaugh’s program. Thereafter, the National Organization for Women (NOW) focused upon persuading local business sponsors to cease associating themselves with Limbaugh’s program. NOW organized a series of protests at local radio affiliates who carry the Limbaugh program in an effort to convince those stations and local advertisers to sever ties with Limbaugh. Some of the cities where the protests were held included, Washington, D.C., New York City, Phoenix, AZ, Indianapolis, IN, Columbia, MO, Toledo, OH, Grand Rapids, MI, and West Palm Beach, FL. The message that the National Organization for Women sent is that the pressure is not going to stop. Any advertiser who supports, or radio station that carries Rush Limbaugh will be held accountable. “The conservative radio host’s ratings fell 27 percent in the key 25-54 demo in New York City, 31 percent in Houston-Galveston, 40 percent in Seattle-Tacoma, and 35 percent in Jacksonville, according to a selection of the March 29-April 25 Arbitron ratings provided by an industry source. Limbaugh’s detractors attribute the losses to a rejection of the show following his controversial comments about the Georgetown law student. First the drug-addicted Limbaugh loses his advertisers and then he loses his listeners. This looks like the demise of Glenn Beck all over again. How low can Rush go?